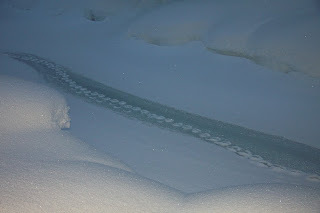 One of our February groups discovered the "Northwest Passage" ski run that devours up a nice 1100 meter descent. Our guests have been enjoying epic powder conditions so far this season. 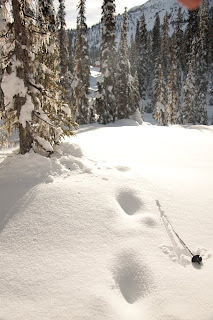 The snowpack at the lodge, as of March 16th, has reached 375 cm with over 500 cm at tree line, here in the Cariboos. Shovelling has been epic at times as well. Endangered Mountain Caribou below the lodge during a snowstorm at the end of January. Wolverine are ubiquitous in the North Blue river valley. Great to see these recent snow scenes - makes the place come alive for us city dwellers.